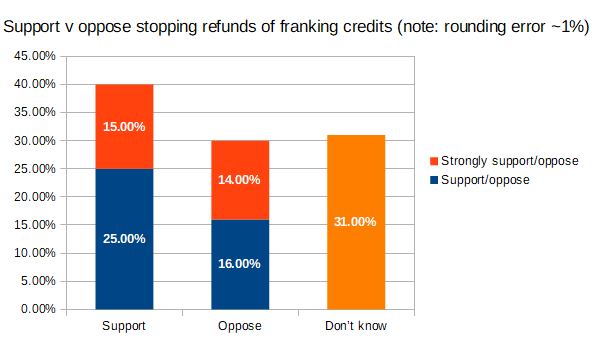 More people support stopping refunds of franking credits than oppose it, according to a new poll. The latest Guardian Essential poll found 39% total support for stopping refunds of dividend franking credits. 30% in total oppose the measure, with 31% answering ‘don’t know’. Included in these figures are 15% who ‘strongly support’ stopping the refunds, and 14% who ‘strongly oppose’. Labor has a policy of stopping franking credit refunds for many taxpayers, though there are differences between Labor’s policy and the question asked. 50% of those who vote Labor either support or strongly support the measure, compared to 32% of Coalition voters. Comparing voters, only the Coalition had higher levels of opposition to stopping refunding of credits (44%) than support. Labor, Greens and Other voters all had more support for the measure than opposition. 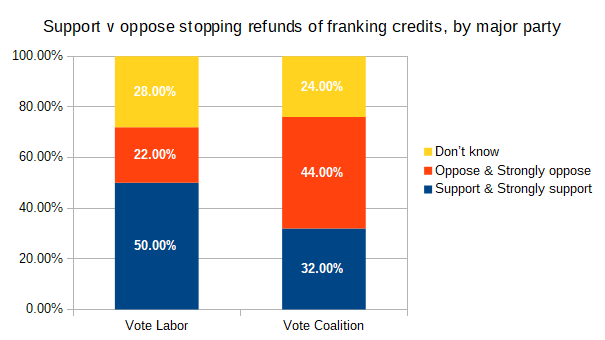 Those most likely to oppose stopping refunds of franking credits were those aged over 55 (42%), while people under age 34 were most likely to support it (54%). Respondents with a household income over $78,000 support stopping refunds 48%, and those with a university education 46%. When companies pay dividends to Australian shareholders out of after-tax profit, shareholders receive franking credits, which they can claim as a tax deduction. If the shareholder does not pay any tax, they receive a cash refund from the tax office. This system is known as “dividend imputation” and these cash payments cost the Government about $8 billion per year. The Labor Party has proposed to end the cash refunds for imputation credits. Taxpayers will still be able to claim a tax deduction. Do you support or oppose ending the cash refunds? The question does not state that, under Labor’s policy, Age Pensioners will be exempt (also, technically, franking credits aren’t a tax deduction). The same poll found that, Federally, Labor is ahead of the Coalition 54% to 46% on a 2 Party Preferred basis. I would like to know how many were under 50 years and how many were already tax payers rather e.g. welfare recipients. A breakdown so that a better understanding of these results results. However, Essential says: “Those most likely to support ending the cash refunds for imputation credits are …full-time workers (46%), those with a household income of over $78,000 (48%)…” Which suggests stopping franking credit refunds has more support than opposition amongst tax-paying workers. The last sentence of the poll is confusing and could influence people answers. The question in its very nature was loaded and biased towards ending franking credits to self funded retirees . It dismisses the fact that low income earners below the tax free threshold will also lose their franking credits as well as pensioners past the 28th march date . It will also affect a large number of WOMEN superannuants who have little super as it is , so much for Labor looking after the poor people in the little end of town. Did they ask any of the respondents did they know what a franking credit was ??? or ask them for a brief description of what they thought the definition was. The Guardian is a Lefty Pinko Socialist Labor supporting newspaper…what would you expect the results would be ??!!!!! The question was loaded in favor of Labor’s policy because it did not disclose that overall the imputation fc rebates total -$40 Bn per year including cash refunds and tax discounts (offsets) of otherwise fully payable tax bills. The term “cost” is incorrect because the imputation system is a re-assignment of the tax paid by the dividend payer to the tax account of the dividend receiver. Since the tax liability of the receiver is not known at the time of payment to the ATO the receipt by the ATO could not be regarded as “revenue”, The value of the tax paid is a pre-payment of the receivers tax. Since the final tax receipts of the government is unchanged if all franking credits were refunded in cash to non-taxpaying recipients or if they all were credited against otherwise fully payable tax bills of tax paying taxpayers, the question is misleading. The question implies that there is an extra “cost” of cash refunds compared to FC tax offsets. There is no such difference. The question is not appropriate to the reality of this policy, is misleading and just perpetuates the lack of understanding of imputation by voters as a whole. At the age of 68 we have more than paid our fair share of TAXES and it is now time we enjoyed some small rebate or franking credit that maybe offered by our Governments. After all most of us will be dead in 10 years time and the small cost is peanuts compared to our working lifelong PAID TAXES.